Selig Polyscope Week is a collaborative effort between Chicago Unbelievable and White City Cinema – their first post of the week, is right here: The Secret History of Chicago Movies: Selig Polyscope. 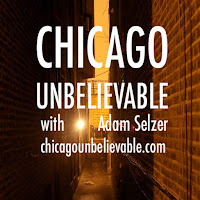 It provides a great overview of the history of Selig and his Chicago studio. 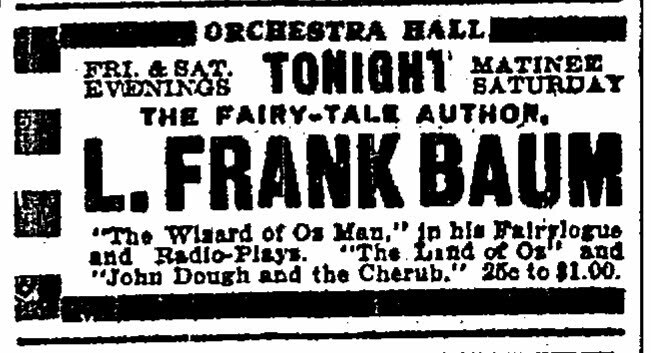 While Col. Selig made hundreds of movies at his Chicago studio, the best-remembered today is probably The Fairylogue and Radio Plays – even though it no longer exists. This was the first Wizard of Oz movie. 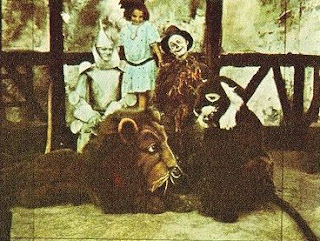 It was not a movie (or radio play) in the traditional sense of the word – the “radio plays” were a series of short Oz-based movies that were hand colored and projected during L. Frank Baum’s touring show, during which he interacted with the movies. 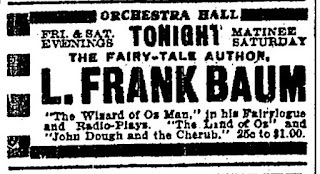 This show rolled into Chicago to play at Orchestra Hall in October, 1908. The mulitmedia show was years – decades, really – ahead of its time. However, while critics generally loved it, they didn’t seem to take much notice of it as being anything more than a childrens’ show. The Scarecrow, Tin Woodsman, and a number of other pleasant characters returned to Chicago Thursday evening under interesting circumstances. In the first place, they brought with them their creator, L. Frank Baum, who wore a lovely white frock coat and won the affections of a good sized audience of children and grownups. In the second place, they added two perfectly good new words – “fairylogue” and “radio-play” to the vocabulary of our already overworked press agents…. A fairylogue is a travelogue that takes you to Oz instead of China. A radio-play is a fairylogue with an orchestra…in a radio play there is the added advantage of having a cast of characters before you and knowing just who impersonate the people on the stereopticon screen. The idea is a new one, and with Mr. Baum’s charming whimsicalities as its basis proved to be well worth while. Exactly what Baum meant with “radio play” himself is not known. At one point it was claimed that the clips had been colorized by a man named Michael Radio in France, other sources say that “radio” was a buzz word for “high tech” at the time. In any case, it would be over a decade before anyone thought of “radio” as an audio communication device. Just about every researcher who looks up The Fairylogue winds up falling down a rabbit hole researching Romola Remus (later Romola Dunlap). Her father, George, became a bootlegger, ended up murdering a lover, and is sometimes said to be the inspiration for The Great Gatsby. In her later years, she often reminisced in newspapers about turn-of-the-century Chicago, once writing about meeting Robert Todd Lincoln with her father on Michigan Avenue. The 535 Cleveland Blog is another that became fascinated with Romola. Mike sent over a link to Selig’s 1910 Oz movie. It has its charm although Turner was no D.W. Griffith!